In today’s internet-driven world, word-of-mouth is rapidly being replaced by the online reviews. 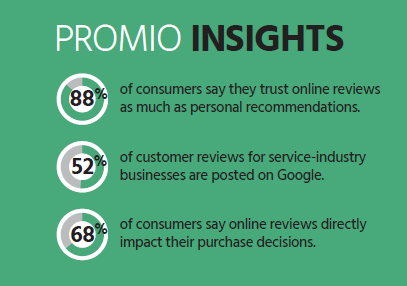 88% of consumers say they trust online reviews as much as personal recommendations and 68% say online reviews impact their buying decisions. That’s why businesses today must work proactively to build, monitor, and grow their online reputation if they want to grow. The world of online reviews can be overwhelming and confusing. Understanding which sites are most important to your business, getting your customers to leave positive reviews, and responding to both positive and negative reviews can be a full-time job. Thankfully, Promio can do it all for you – automatically. Promio will survey all of your customers to see which are happy and which aren’t. Happy customers are then directed to post positive reviews about your business on line while you’re alerted to follow-up with unhappy customers. Promio then monitors all of the leading review sits and alerts you when a review about your business is posted and recommends if and how to respond. It really doesn’t get easier. Automated customer satisfaction surveys and tracking. 24/7/365 monitoring of the most important online review sites. On-call support to help craft responses to reviews. Robust reporting to show overall satisfaction, trends, and missed opportunities. More positive online reviews mean a better reputation and drive better SEO. Real responses to reviews show your commitment to customer service. Full automation frees up your time to focus on other areas of your business.